In this important video below, Ponovezh Rosh Yeshiva Rabbi Shteinman Shlit”a is presented with an urgent question that has implications for Jewish schools all over the world… A Beit Shemesh principal wants to reject 2 boys from his school because their mother is “more open” and “a different type” from the rest of the parents at the school. But I’m not only posting this because I’ve been the victim of school snobbism. I am posting this because I AM also a school snob! I also don’t want my children’s schools to accept kids from families that I perceive as “less religious” because I fear they won’t be a good influence on my kids and on the religious atmosphere of the school…And watching this video makes me recognize that my attitude is flawed and based on ego rather than the yirat Shamayim it’s posing as. I’ve seen this a few months ago and in my opinion it’s more frighting and embarrassing to see how they try to manipulate and twist in order to receive the answer they want. Powerful! Gives me lots to think about it. At first I didn’t get why those two men were laughing because what the RY said was serious but then I understood, they were embarrassed because sometimes we all do feel that way, that those kids or that family is not good enough for us. Thanks Jenny Chana for posting it. This attitude upsets me for eleventy-hundred reasons. I’ll try and address the biggest issue. For me, tthis is less about schools than about acceptance. For years, decades, I have heard that as an American Jew, I would not be recognized as Jewish in Israel. I have never understood this. I became a bat mitzvah. I am raising my son in the Jewish faith. We are preparing for his bar mitzvah, and it is a joy to not only listen to him chant his prayers, but to see him practicing the 613 mitzvot. If frum Jews — a teeny, tiny subset of Jews — cannot accept each other in spite of their differences, how do one ever hope for peace in Israel? Seems to me, Orthodox Israelis need to understand that they are being out-reproduced by the Arab nations that surround them. If no one ever picks up another gun, Israel could be lost simply because of sheer lack of numbers. This is the time to draw everyone in. That Rebbe is a very wise man. Renee, thanks so much for your insightful comment…One correction, though. American Jews ARE 100% recognized as Jews in Israel. In fact, there are tens of thousands of us American Jews living in Israel, living as fully-recognized Jews. Is it possible that you are referring to Reform and Conservative conversions which are not recognized here? I’ve read about some bias against American Jews in Israel, but certainly nothing that would prevent them from being accepted as Jews. I’ve read several BT blogs that mention this lack of acceptance as far as schools go. Bias, being a human trait, will have to be fought or ignored because it’s certainly not going away. its very disturbing to me all this pure and utter nonsense and a huge shame to the religious – this behaviour is just horrible – look at the scandals we have here in israel with these issues. I heared an interview regarding the acceptance to seminaries in israel and the problems parents are having trying to send their girls…the lady from the seminary said something true, she said that those who dont get accepted dont fit the criteria that the school requires at a 100% lwevel so if it means they keep the right kashrus but use an unkosher phone or listen to radio, than that disqualifies them, whereas other seminaries allow these things, but pushing and arguing to have a girl attend a seminary where she is taught 1 thing and at home its a diff story causes confusiin and difficulty for the student herself…so why do it? Because the student is a legal and halachic adult who is old enough to take responsibility for herself and go on the derech that she chooses. It is her decision, not her parents’ decision and not the seminary’s decision, whether she wants to attend an institution that holds differently from what she is used to. And it is her decision whether to continue to hold like her family or like the seminary. We’re talking about 18-year-olds, young women who are often just a short few months or years away from getting married and starting a family, not impressionable 5-year-olds. I just think that people need to be more realistic and stop pushing for a “name” or organization that isn’t them…it also means sacrificing the modern world and “open” mentality for a complete righteous leep of faith and dedication..i admire families that are able to stay apart from the modern world and I hope to get to that level one day…meanwhile I still feel the freshness of my tshuva and love it. First, there is a longer version out there somewhere, where they continue to argue with the Rav, and eventually he gets up and starts screaming at them. Second, I wouldn’t say that this is a generational shift. Or necessarily the outlook of the previous generation. Rav Shach, Rav Shteinman’s predecessor was famous for his rejection of B”T’s from his Yeshiva, and their children from the schools he over saw. He was also largely responsible for the quota system that barred Sephardi girls from B”Y schools… ect. 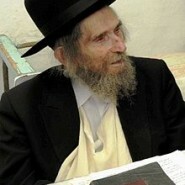 I am glad that in this Rav Shteinman didn’t follow in the footsteps of his Rav, but it is not a generational thing. Motzi shem ra on Harav Shach ztl! Be careful with your words! Truth is not a Motzi Shem Ra. You may be able to say that it is a lashon hara, but even then… you do realize that just a year ago the major Lithuanian and Chassidic Rabbis lead a march through Jerusalem seeking segregation of Sephardi children form their own right? That was in a city run “public” school. You don’t think that the Chareidi school system got so selective over night without any sort of Rabbinic approval do you? Mr. Tzadok: ” a year ago the major Lithuanin and Chassidic Rabbis lead a march through Jerusalem seeking segregation of Sefardi chidren…”. You are one bitter and delusional person. This occurred only in your warped mind. Once again, the separation, the rejection of another ‘type’ of Jew. When will we all learn…the ultra orthodox, the modern orthodox, the conservative, conservadox, the secular…we are all Jews and have the right to choose where we hold, as do our 18 year old children. It is not for a school to judge, and it is not for the community to judge who is fit for a school. If you are less observant and want a stronger held school for your child, wonderful. Let’s look at the positive side, and perhaps the children will grow and learn in their studies and decide to take more on. Enough of the fighting amongst us or we’ll never grow as a people. Is it any wonder so many of our youth run from their frum upbringing and no more wonder why secular Jews are so opposed to Yiddishkeit. Live and let live people. Your child can only benefit from exposure. Build a solid enough home foundation and they should be able to stand firm with what they believe and were taught. I think our experience and our kids’ experience has been 100% positive. And I see that once my kids start attending National Religious school the infusion of emuna and passion for Yiddishkeit and Torah they received in Gan remains with them over the years. And one thing that I am extremely happy about…My kids occasionally hear anti-Charedi comments from their classmates, and the general feeling among the students at my kids’ school is quite anti-charedi. But my kids, because of their early education, feel a great deal of fondness and respect for the Charedi community. I wouldn’t recommend this unusual choice for everyone, maybe for us it works since we as a family are VERY hashkafically diverse (as anyone who reads this blog regularly already knows) and straddle many different worlds, but for us and our kids it’s worked wonderfully. At the same time that our religious yeshivas reject kids for ridiculous reasons (and therefore label them), the secular world has a policy that every child is accepted and given an education. So you tell me, who is actually frum? I wonder why children are expected to arrive as a perfect package in the Torah world. Surely the onus is upon the Institutions and their Rebbes to impart the light of Torah upon their students, and not upon the children or their families to impart their “aura” upon the school!!!!! Where is their confidence in the power of Torah? Where is their belief in their own educational system? Where is their ahavat yisrael and understanding that every Jewish child should be given an opportunity to learn Torah? At the same time, I empathise with Chana Jenny that at some point we all want our kids to mix with “good kids”. The question is how far do we need to go…. As a reluctant observant person many years ago, the only gan my husband and I agreed on was a CHASSIDISHE gan that was religious enough for him, but ACCEPTED ME IN MY JEANS!!!!!!!! BAruch Hashem, they knew what they were doing. I have never forgotten that. The rebbetzin simply told me what their rules were regarding no men at the birthday parties etc because the ganenot sang etc, and that was it. Mutual respect. And, particularly during this time of the Omer: What if Rabbi Akiva’s “gan” hadn’t accepted him way back then, because he wasn’t from the “right family”?!!!!!!! While I love the idea of frum schools being more accepting of other Jews, I think it would be good to have a limit to how many kids are accepted who are not at a school’s desired level of “frumness”. Our orthodox school is about 95% secular/nominally religious, and 5% frum. Speaking from the experience of my own kids, this type of situation has done more to harm their Yiddishkeit than to help it. But then where do the kids who are turned away go to school? They don’t deserve a Jewish education? It’s a very difficult matter. Well put YL, espy the comment about Rabbi Akiva. Espy appropriate for these days. Excellent point. It’s hard to tell what’s really going on in this situation based solely on this small clip, but I love the desire of the Rabbi to be accepting to those who desire to attend the school. I can also understand the POV of the parents at the school. If we aren’t careful, he’s right. This logic of exclusion, taken to a fuller extent looks like Beit Shemesh…an effort to exclude all who don’t strictly share our standard by whatever means we deem fit…justifying the spitting on an verbal abuse of women and girls despite their being entirely modest. I’m all for standards. They’re vital, but there must be a limit to the discrimination. I’m just relieved that I don’t have to make this decision and I don’t envy those who must. This reminds me why I’m grateful that my children are receiving an education where they are taught by their Rebbeim and Morahs to respect all people. I’m also finding myself fortunate that my job takes me away from a jewish community so I don’t have to deal with this stupidity. I’m also able to interact with people from a myriad backgrounds, religions, and cultures and see them as tzelem elokim. Why is it that children learn derech eretz much more easily in smaller jewish communities? I think it is because often we are more concerned with looking good/avoiding looking bad to ourselves, friends and family rather than serving HKB”H the way He wants us to serve Him. At the end of your life what will be the most important legacy you’ll leave your children? Is it the number of siyumim, p’sukim, Rashi, blatt gemara completed or the values contained therein from which HKB”H wants us to draw and live? Not all small communities are good either. Some of them are just as bad. Better just to stay away from toxic nasty people. Believe it or not, some frum Jews don’t like Baalei Teshuvah and would prefer that all secular Jews just drop off the earth or die in a holocaust, rather than having to educate our children after we become religious. Having lived in California and now in Florida, and worked in Chabad mosdos, this exclusionary attitude is hard for me to relate to. This also affects kids with disabilities even from frum homes. This Rav is so on target saying that it is Ga’avah on the part of the parents. Children learn from what they see, hear, and have modeled by their parents, teachers, not just classmates. Ahavas Yisroel demands that we treat others and their children how we would want to be treated. I noticed how the people tried to imply that the children were ‘slow’ as if this a reason as well.